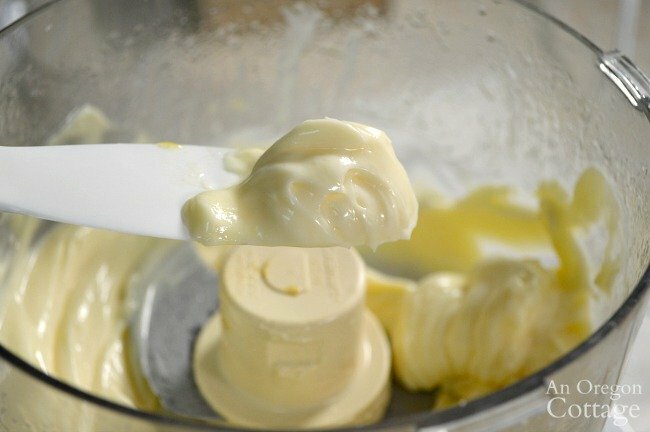 Make this homemade mayonnaise recipe in just minutes using either a food processor or an immersion blender. 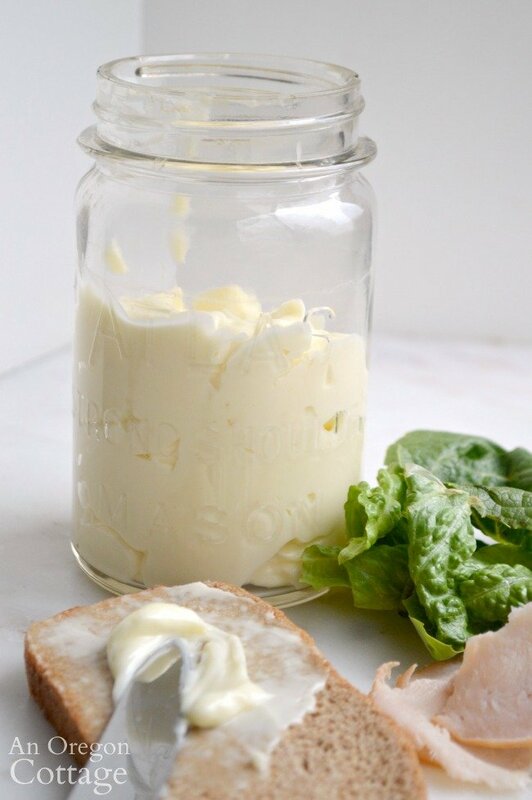 Using a handful of pantry and fridge ingredients – including your choice of oil – you can literally have mayonnaise whenever you want, saying goodbye to store bought! Some links in this article are affiliate links and if you click on them and purchase I will receive a small commission at no cost to you. 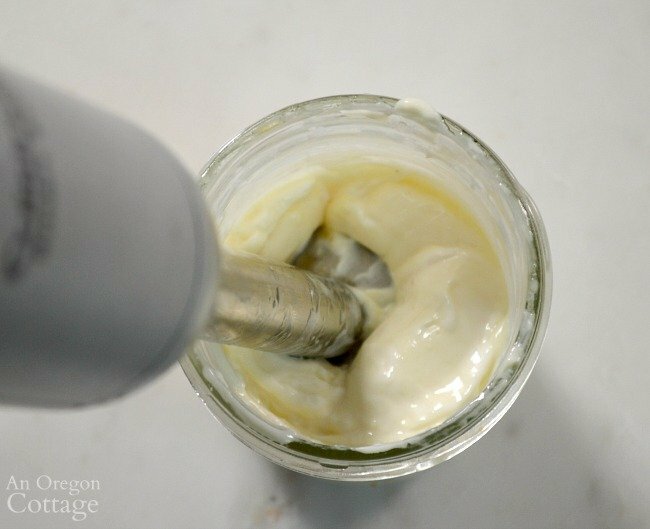 NOTE: This recipe for homemade mayonnaise was one of the recipes I published within the first months of starting An Oregon Cottage. It was (and still is) magic to me and something I wish I had known about earlier, which of course made me want to tell everyone I knew about how incredibly easy is is to make mayonnaise at home. It’s one of the core “pantry basic” recipes, along with things like ketchup, chocolate syrup, and bread crumbs. I don’t know why it took so long for me to make homemade mayonnaise. It takes less than 10 minutes total including clean up, and costs just pennies. The main ingredients are eggs and oil, which we always have on hand. I guess it was because like the other pantry basics, we grew up seeing them purchased at the store and never thought about making them at home. In fact, I probably wondered if mayonnaise even could be made at home. Which is kind of sad, because it is an old, time-honored recipe dating from the 18th century that was obviously always homemade. Now after making it myself I want to let everyone know you CAN make it, too! Have all your ingredients at room temperature. TIP: To bring your egg to room temperature quickly, immerse it in a bowl of hot tap water for 5 minutes. 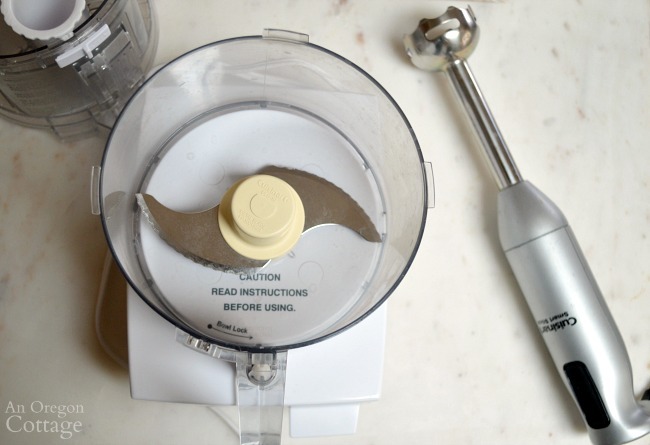 Use the right tool: I show how to use either a food processor or a hand-held immersion blender, but you can also use a regular blender using the food processor steps (you’ll probably have to scrape the sides a bit more). If you have one of these tools, all the other ingredients are things we usually have on hand in our pantries and refrigerators, making it actually quicker to make than to run to the store to buy it! At it’s core mayo is just oil, eggs and a little salt whirred up until thick (think about that the next time you pick up a jar at the store and look at the label…). You can make it this basic if you want though you’d need to add a bit of water instead of the vinegar or lemon to help bind and keep the egg and oil from separating. The last two are optional and can be omitted or adjusted to your tastes, or you can try other seasonings. Add lots of fresh garlic and you have an ailoi for dipping, add a tablespoon of Sriracha and you have a slightly spicy spread, and so on. 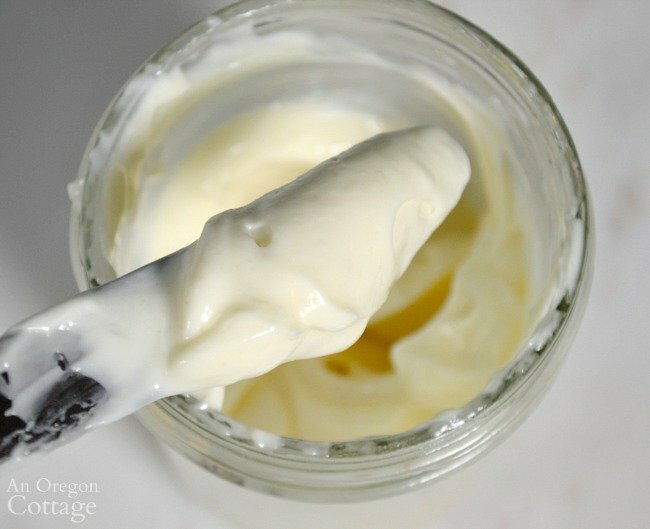 What oil can I use in homemade mayonnaise? Now it’s time to make mayonnaise (Ha – reading this will take longer than making it either way!). 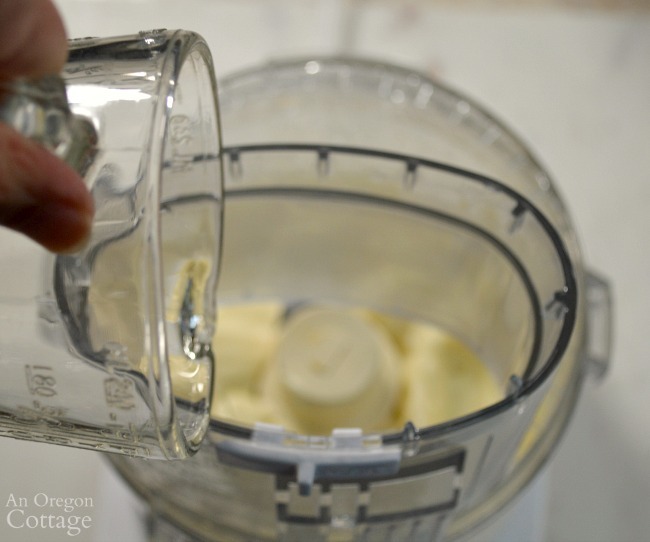 Following are two ways to make mayo – with a food processor or with a hand-held blender. Read through and choose which way will work best for you! 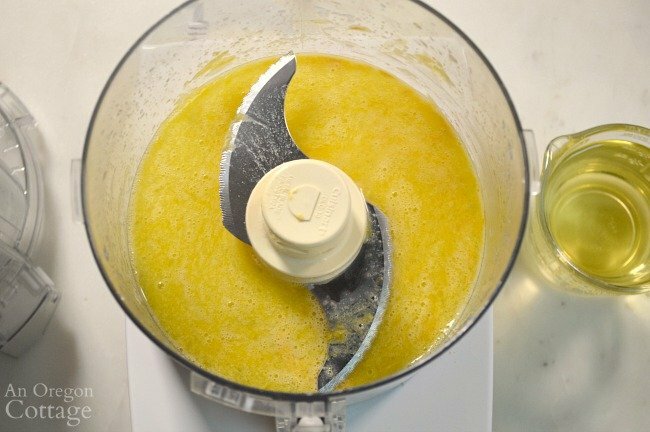 Step 1: Add the egg and remaining ingredients – except the oil – to the bowl of a food processor. Note: I guess I should take this moment to point out that the egg is raw and will remain raw. If that is a concern for you (usually that means elderly, toddlers, or problems with health) then you may want to steer clear of this recipe or try a pasteurized egg product. Personally, I have had no problems eating raw eggs and I know no one who has, though I’ve read the warnings. So I leave it up to you. Step 2: Process all the ingredients together well, 20-30 seconds. Step 3: With the motor running, add the oil of your choice in a slow stream. The mayo should start to emulsify. Step 4: Process another 10-20 seconds. Remove the cover and prepare to be amazed – there will be actual real mayonnaise (I swear, I still can’t believe it’s going to happen!). Step 5: Adjust the seasonings to your taste. The first time I made it, I had to take several tastings (I used a lettuce leaf) and I wrote down what I liked so I when I made it again it would be the same. Even though making mayo in a food processor is fast and easy – using an immersion blender is even faster! You can make it right in a wide-mouth mason jar, so clean up is quicker, too. I pretty much make mayo this way now, unless I need a larger batch for something. Step 1: Add ALL of the ingredients, including the oil, to a wide-mouth pint size mason jar. This is the major difference from the food processor – you’ll add the oil with the other ingredients. Step 2: Insert the hand held blender fully into the jar. Hold the blender button down and start mixing all together. You will see it start to form mayo pretty quickly. Move the blender up and down a bit to make sure the egg is fully incorporated. Ta-da! Perfect mayo in minutes, all ready to go in the jar you’ll be storing it in. As if making mayonnaise wasn’t magic enough, right? Not bad for 2-5 minutes of your time and being in control of all the ingredients. 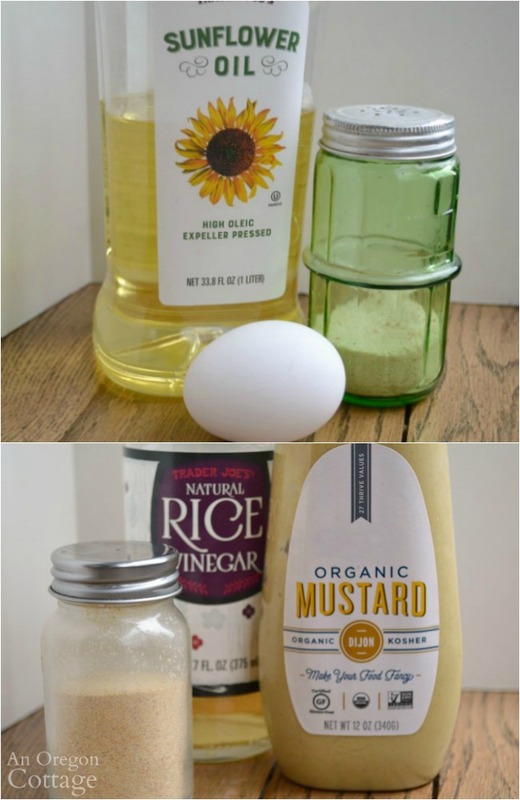 Either way you make it, you can store your homemade mayonnaise in a glass jar the refrigerator. It should last more than a month. In our house only after a month do the edges start to go “clear” as old mayo can do (I don’t know how else to describe it…). Oh well, now you know that with just an egg and some oil you can always make more! 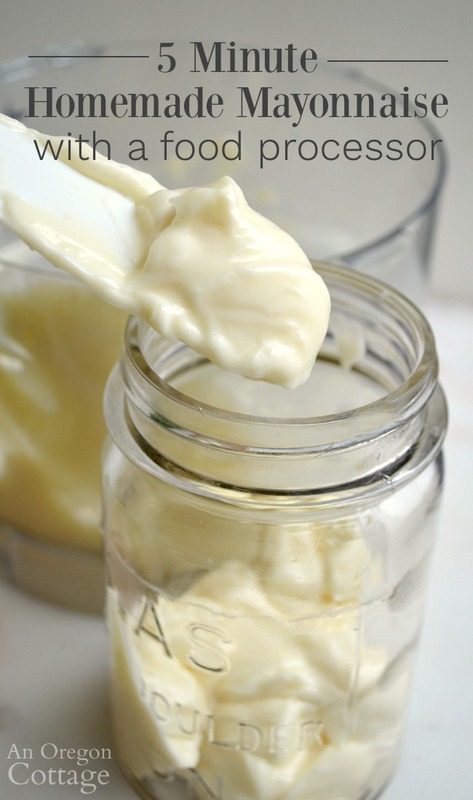 Click the arrow for the full homemade mayonnaise recipe (with print options)! Welcome - I'm so glad you've joined the AOC community! Your first step is to check your email to confirm your subscription and you'll be on your way to your free eBook and more printables. I want simple dinner ideas! I’m a culinary student and you can actually do this by hand with a balloon whisk. Also they teach to add a pinch of cayenne and white vinegar as well as a squeeze of lemon. Also if it gets to thick or if you want a whiter creamier product you can sprinkle in very cold water to get it to the right consistency. This also doesn’t last long, just a couple days. Thanks for these ‘chef’ tips, Rebecca – appreciate it! 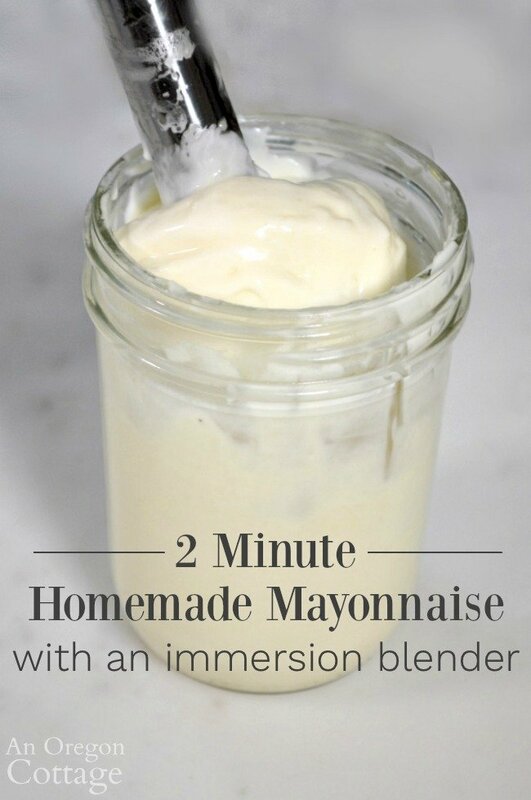 This is the BEST mayo recipe! I have tried others that were pretty good but none compare to this. I used vinegar not lemon juice and it is just like deli mayo. Thank you so much for sharing this!!!!! Thanks for sharing! I’ve been thinking of making mayo lately because I’d like to avoid the nasty oils they use. Newman’s Own Organic Extra Virgin First Cold Press Olive Oil (long name!) would be great for this because it is yellow and has a light, nutty flavor. You’d think it would be greener and heavier, but it’s just the opposite. Try different grades, just don’t go refined. I hope this works with Egg Replacer because my kids are allergic to eggs and that soy-based mayo is just gross. That Newman’s Own sounds like a great option, Katie. Let us know how it works with the egg replacer! I put a couple of TBSPs of Flaxseed with a tsp of water in my Vitamix to make a egg white like substance.I use it as a substitute for egg in my breads. It has the consistency of egg white and am wondering if I could use this in place of an egg. I will try it and post the results. It’s better tasting if you don’t use the extra virgin olive oil. I don’t mind the flavor with the cheaper, less strong tasting olive oil, but I prefer it with organic sunflower oil and mostly use that now. I use half and half…half evoo and half sunflower or whatever. Works well and cuts the strong flavor others are talking about. I have tried mayonnaise recipes with olive oil and they were TERRIBLE! How did you get it to taste right and not be overpowering? I even used organic olive oil and it was so bad it had to be thrown out every time. I would love to find a good mayonnaise recipe that does not use the “bad” oils. Hmm, I’ve heard from others that they really don’t like the taste of olive oil in it – have you tried a slightly more refined olive oil, usually labeled “pure olive oil?” This is oil from the second pressing and has less of the strong flavor, but still is a good alternative to industrial oils. If that doesn’t work, I would try the least offensive nut or seed oils – maybe sunflower? I think you could test on a piece of bread and if it seemed mild, then try it in mayo. I’ve also used expeller-pressed coconut oil (no flavor), but it got stiff and was just weird, though Brian still ate it. 🙂 Everybody’s different, so you’ve just got to search around for what works for you! This is not a suggestion – it is a question. Can you use coconut oil to avoid having the “green” color and still be using a healthier oil? I see a lot of health fool people pushing this coconut oil and some people saying eat it out of the spoon. I tried a spoonful and it is, to me, like taking a mouthful of any other oil or grease. 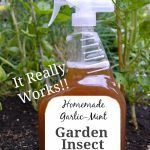 So I have a couple of jars to use some other way, and was wondering if it might work in this. I have scads of olive oil as well, so either way it will be OK with me. Once you mix the mayo with the tuna or other stuff you eat it with, you won’t notice the green, I hope. You’re right, Gena – you don’t notice the green from the olive oil except when you’re spreading it on bread. But some people do find the stronger flavor of EVO to be off-putting. I actually HAVE used coconut oil in this recipe (I’m laughing at your typo of ‘health fool’ instead of food – what a freudian slip, huh?) and it’s just very stiff when refrigerated, like coconut oil is. That’s the only problem, ’cause it makes it a bit hard to spread. If using it in food like tuna, a few seconds in the microwave should soften it. I just made this with a freshly laid egg from one of my chickens 🙂 Didn’t have to worry about bringing the egg to room temperature! It’s dark yellow and delicious. I followed the recipe exactly as written, except I did use canola oil. 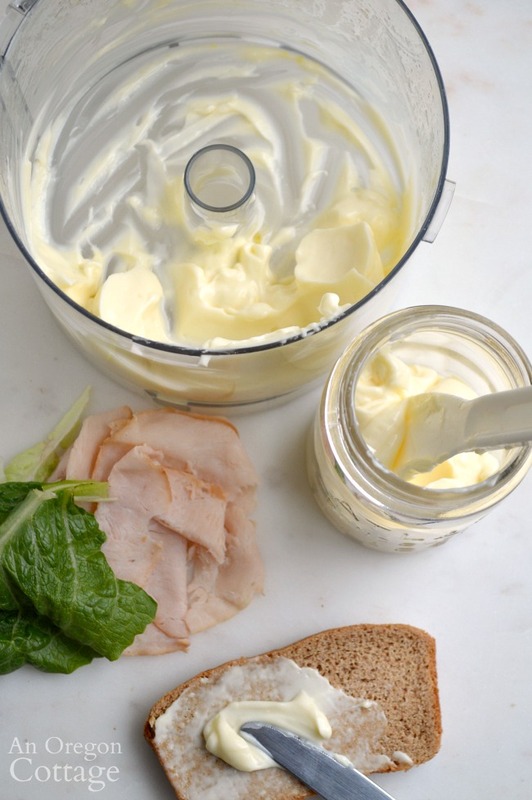 Now, I’m going to make your classic Caesar dressing with this mayo!! Just out of curiosity: jars are sealed tight on the store shelves and make the old “pop” when I open them. Is this something that is just stored in a Ball jar (similar) and placed in the fridge? 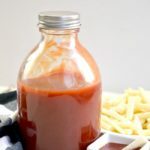 I see your recipe states it lasts about one month in the fridge if not consumed first, but is there a way to make multiple jars if I were to make a big batch and put it in storage? Great, great site BTW!